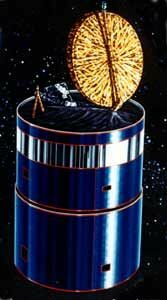 American communications satellite. Based on Hughes HS-376, single antenna on despun platform, spin stabilized, hydrazine thrusters, body mounted solar cells provide 982 W BOL. Status: Operational 1994. First Launch: 1994-08-10. Last Launch: 2000-08-17. Number: 4 . Gross mass: 1,770 kg (3,900 lb). Height: 7.09 m (23.26 ft). 24 C-band transponders with 6 spares, 10 W TWTA, EIRP >34 dBW over most of target territory. Brasilsat B 1, 2, 3, 4 Communication satellite built by Hughes for EMBRATEL, Brazil. Launched 1994 - 2000. Used the HS-376W bus. Family: Communications, Geosynchronous orbit. Country: USA. Launch Vehicles: Ariane, Ariane 44LP. Projects: Brasilsat. Launch Sites: Kourou, Kourou ELA2. Agency: Hughes. Bibliography: 2, 276, 4, 552, 554, 6, 12562.